Sorry Siri, but Alexa has remained the most popular AI in consumer reviews of Smart Home devices. As the Smart Home market continues to develop and improve, the need for simple communication and control intensifies. In February 2016, we reported that Amazon was winning the battle for Smart Home consumer delight with their Echo smart speaker turned Smart Home hub. Since then, Amazon introduced two more Alexa enabled devices (the Dot and Tap) and has been improving the capabilities of the Alexa to allow users to control an ever expanding list of connected devices with Amazon’s AI. 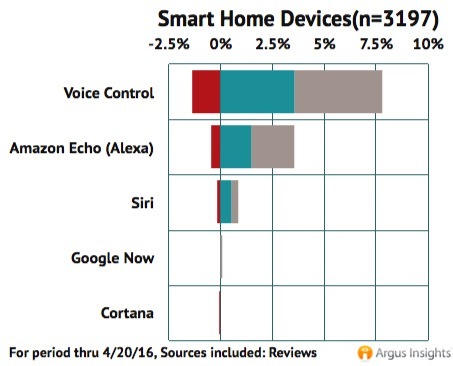 Recently, Smart Home consumers are discussing Amazon Echo and Alexa far more than voice control solutions from Apple, Google, and Microsoft; as shown in the funnel below. Don’t miss our State of the IoT Webinar tomorrow! You can also keep up with what’s top of mind in the Smart Home Market by signing up for our free newsletter.